Cooking with beer is a unique culinary experience and one easily mastered with a few guiding ground rules. Beer provides similar cooking properties as wine, but with an even larger variety of flavors. Cooking with craft beer will lend a slightly different result than mainstream beers. You’ll need to consider carbonation and yeast levels when choosing your cooking beer. Usually brewed in small batches, craft beers have more concentrated flavor profiles and sometime higher yeast content. Beer is a natural tenderizer for meats, which makes it perfect for braising or slow cooking large cuts of meat. And, beer is great leavening agent for baking fluffy breads, rolls and biscuits. Wheat beers and pale ales with their crisp, almost fruity flavors, pair well with breads, cheeses and seafood. While porters, a mellow combination of pale ale and stout, add an earthy flavor soups, stews and meats. Stouts are smooth in flavor and texture, lending them to fit in best with dessert dishes. As a general guide, use light for light, such as pale ales in fish or chicken dishes, and dark for dark, such as porters with red meat. Avoid lower calorie and high hop beers because low calorie beers have lower levels of flavor and hops become even more bitter throughout the cooking process. A word or two of caution…cooking with alcohol also has effects on your dish outside of just the beer flavor. Depending on cooking method, temperature, time, amount added and other factors, some of the original alcohol in beer can linger in the dish. Also, the alcohol in beer could kick spicy foods up a notch. So, you may want to dial down the usual level of spice you add to your recipes when cooking with beer. I used Tin Roof Brewing Company’s Voodoo Bengal pale ale in the biscuit recipe that follows. Their Parade Ground porter is available in the winter, in the meantime Founder’s Porter worked well for the chili. Of course, you can use any brand you can find and there are quite a few to choose from in grocery stores around town. Read the full article at CitySocial.com or pick up a free copy of the magazine around town! Combine cumin, chili powder, paprika, garlic powder, salt and pepper in a small bowl. Shake the spices over the brisket and rub into the meat. Place the brisket into a slow cooker. Top with onions, bell peppers, garlic cloves and tomatoes. Add the chipotle pepper and teaspoon of adobo sauce from the can or jar with the peppers. Pour the porter or stout over everything. Cook covered over low heat for 8 to 10 hours. Shred the beef and stir to incorporate. 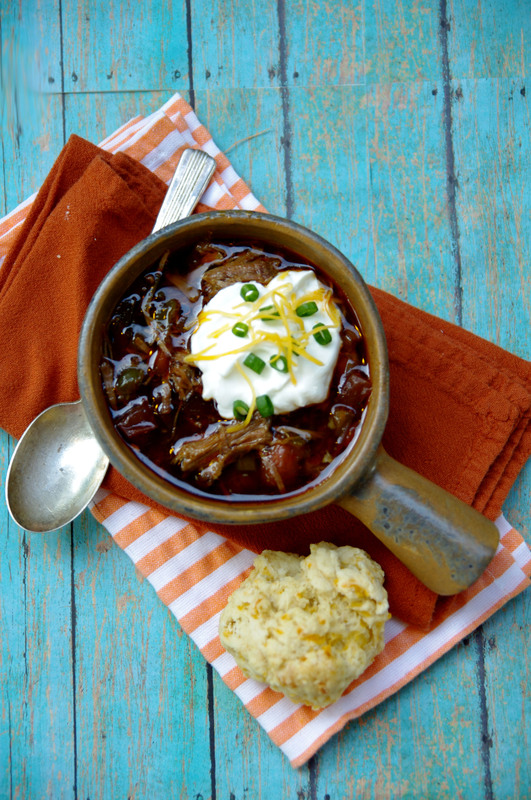 Serve the chili topped with sour cream, chopped green onions and grated cheddar cheese. Preheat oven to 450 degrees Fahrenheit. Whisk in flour, baking powder, salt and garlic powder. Cut in shortening until mixture is crumbly. Stir in beer into the flour mixture until fulling incorporated and the dough is sticky. Fold in shredded cheese until fully incorporated. Grease a cast iron skillet or baking pan. 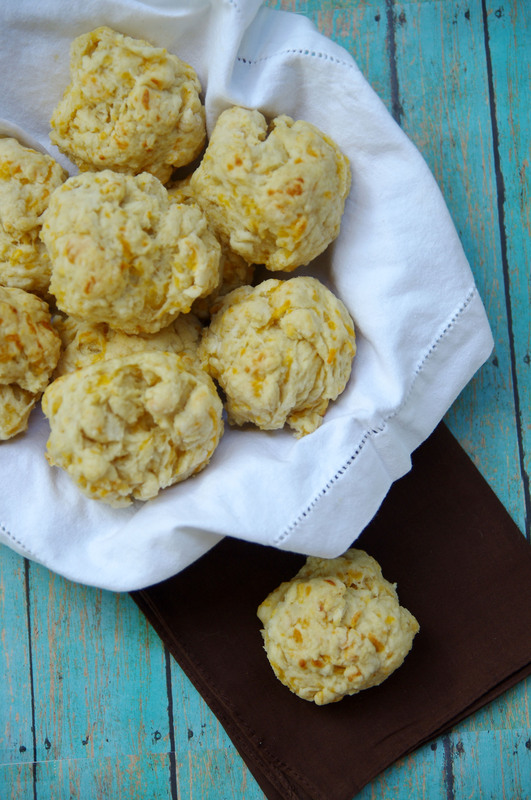 Pull off palm-sized pieces of dough and roll it into a rough ball. Place each ball in the skillet with a half inch or gap in between. Bake for 25 minutes or until golden brown and baked through. Serve warm and buttered with chili or soup or in place of dinner rolls.